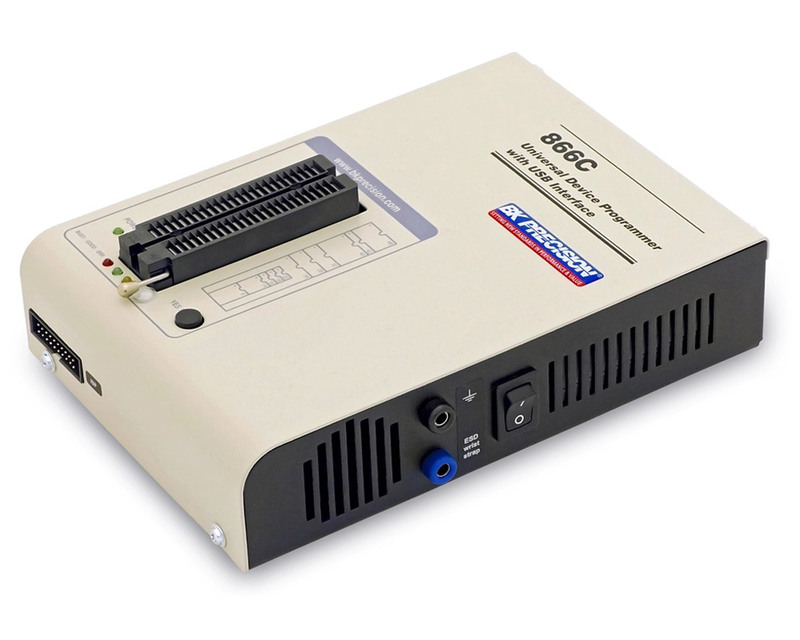 The 866C is a universal device programmer with a constantly updated extensive device library. It has been designed for ease of use and reliable performance and it is ideal for use with Laptop/Notebook computers that do not have parallel port interfaces. Whether you are working with PLCC, SOIC, TSOP, DIP, TQFP, SSOP, PSOP or QFP, B+K Precision has an extensive line of socket adapters to interface with any IC package. This programmer is much more than a basic EPROM Programmer and it is a must for anyone that Tests, Repairs, or Programs any electronic device that uses a memory IC. The easy-to-use control program with pull-down menu, hot keys and on-line help, also the 866C can be used by users with technical levels ranging from the Hobbyist to the professional R&D Engineer. Selecting of device is performed by its class, by manufacturer or simply by typing a fragment of vendor name and/or part number.